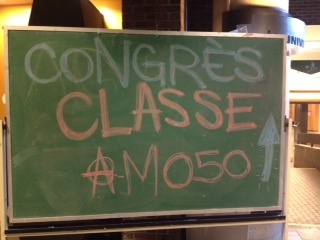 The past two days, I finally got my first chance to check out self-governance in Montreal: a neighborhood assembly yesterday, and the CLASSE Congress today. Both in 100% French, and my French is next to nothing. 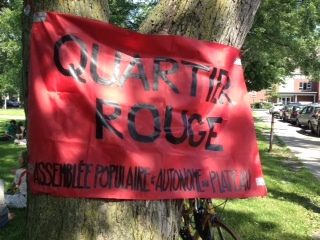 But I can recognize some words, such as “démocratie directe” and “autonomie.” Better yet, I can read the body language of good cheer and respectful interactions, and follow the informal & formal processes–all of which put most of what I participated in and saw within US occupy to shame. CLAC and CLASSE militants are of the same generation and political culture! I was wondering about that before you wrote it, also curious, homogeneity in terms of race and class too? The history of the francophone national minority probably results in a certain amount of solidarity and communal feeling too. It’s not entirely clear what lessons this has for the US, other than, yeah, things are difficult in the US (for a buncha reasons). This entry was posted on June 17, 2012 by Cindy Milstein in Dispatches from Quebec Spring.